The Audi A8 is a four-door, five passenger luxury sedan. The 2009 Audi A8 is a carryover from 2008. The 2009 A8 sedan is available in two different trims, the 4.2 FSI and the A8L W12. The A8 4.2 FSI uses a 4.2 liter V8 engine that is capable of producing 350 horsepower and 325 lb-ft of torque. A 6-speed automatic Tiptronic transmission sends the power to all four wheels through the vehicle’s Quattro all-wheel drive system. Fuel economy is rated at 16 miles per gallon in city driving and 23 miles per gallon on the highway. At the pinnacle of the A8 line is the A8L W12, a vehicle which rides on an extended version of the standard A8’s chassis. The luxury sedan employs a 12-cylinder engine that cranks out 450 horsepower and 49 lb-ft of torque, matched with the same transmission and all-wheel drive system found in the A8 4.2 FSI. The A8L turns in fuel mileage numbers of 13 miles per gallon around town and 19 miles per gallon on the highway. The Audi A8 has been a luxury sedan icon since it was first introduced to the North American market in 1997. The A8 was a revelation for Audi, and its bold styling, V8 power and excellent performance helped the brand build a new image around the world. The A8 has frequently served as a test bed for new Audi technologies, and it has evolved over the past ten years into one of the most capable full-size sedans on the market. The 2008 Audi A8 rides on the second generation platform which was unveiled in 2003. The A8 can be had in standard wheelbase length, or in an extended version known as the A8L. The L is intended to compete against the BMW 750Li, and it is positioned as more of a car to be driven in, rather than driven. Each version of the A8 is equipped with Audi’s Quattro all-wheel drive system, which helps impart the car with a surefootedness that sets it apart from other sedans in its class. The base A8 is equipped with a direct-injection 4.2 liter V8 engine which makes 350 horsepower and 320 ft-lbs of torque. While this is the most common configuration ordered, the A8L can also be optioned to include an enormous 6.0 liter 12 cylinder engine which produces 450 horsepower and 428 ft-lbs of torque. This power plant rockets the large sedan to 60 miles per hour in only 5 seconds, making it the fastest vehicle in the Audi A lineup. Both V8 and W12 engines are matched with a 6-speed Tiptronic automatic transmission, and performance is further enhanced by an air suspension which can adapt the ride height in order to best match speed and driving conditions. The A8 is excellent at matching a tight, performance oriented ride with the need for comfortable driving with a minimum of jostling. Power delivery is effortless from the V8, and flooring the gas pedal in the W12 is like lighting the match on a stick of dynamite – throttle response is immediate and prodigious. Drivers feel very much in command of the sedan, and the all-wheel drive certainly helps to improve both traction and safety. The interior of the A8 is best described as opulent, with the W12 edition of the car replete in leather and Alcantara surfaces. 16-way adjustable memory seats can be double-stitched in offsetting colors in order to add to the feeling of exclusivity that is engendered by sitting in the A8’s beautiful cockpit. 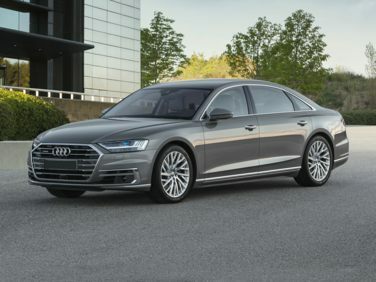 The vehicle is crammed with technological innovation, and Audi is not afraid to push the boundaries of how a full-size luxury sedan is supposed to present itself. The vehicle’s multimedia system is controlled via the MMI interface on the center console, and a 7-inch screen displays all the relevant entertainment information. The Audi A8 is definitely capable of holding its own against the BMW 7-Series and Mercedes S-Class. With a stunning interior and excellent driving dynamics, the A8 is a popular choice for executives or driving aficionados who desire the vast interior space and vault-like atmosphere that a sedan of this size exhibits.